Port Douglas Accommodation Luxury Private Holiday Home 2 FREE Nights Heated Swimming Pool. Hidden away in the centre of a tropical garden, with swaying palm trees and balmy ocean breezes, this wonderful Balinese style holiday home is a joy. The view from every window has the feel of being in a tropical jungle, and the décor is pristine in this spacious home located in the exclusive gated community of Beachfront Mirage Estate. Only a short 50 meter stroll to famous 4 Mile Beach and a gentle stroll to the Sheraton Mirage Golf Course, it shares a tennis court, set in lovely tropical seclusion, with adjacent properties. A heated private swimming pool and cabana is the perfect place to spend a lazy winters afternoon. This luxury holiday home is fully equipped with designer kitchen, including a dishwasher and espresso machine, barbeque for outdoor dining, air conditioning, ceiling fans, laundry room and secure parking. Enjoy pure luxury at this luxurious Port Douglas Holiday Home - complete with gourmet kitchen, spacious living area opening out to large timber deck. Within walking distance to Port Douglas Beach, Golf and easy access to Port Douglas Village, this executive holiday home offers holiday guests an indulgent stay. Five spacious bedrooms have sleeping arrangements that include three king beds and two doubles. Three bedrooms located upstairs each feature private ensuites and additional flat screen TV. Lovely décor and tropical garden views bring a feeling of tranquillity and serenity to these beautiful rooms. 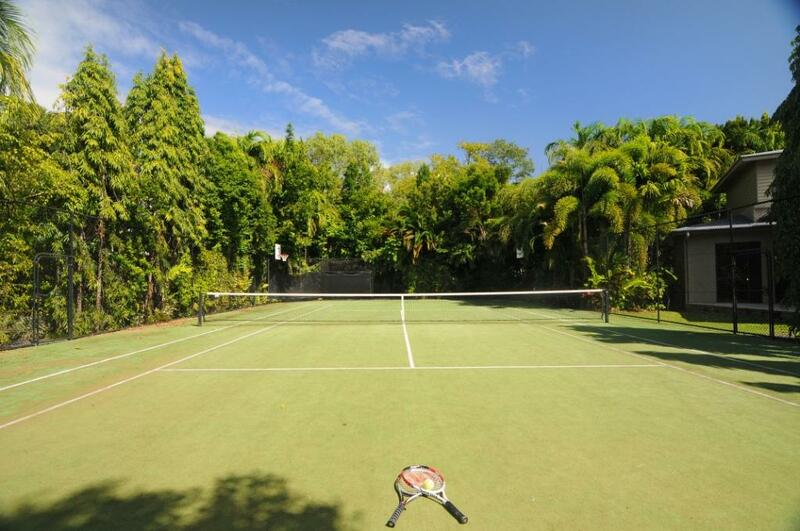 Enjoy direct access to the Tennis Courts (shared with two neighbouring houses), private swimming pool and Spa, and stunning tropical gardens all located only a short walk to Four Mile Beach. The four luxurious bathrooms are pristine and modern. This executive style holiday home is the ideal place for families, groups and wedding parties…..and honeymooners will absolutely love the peace and serenity of this beautiful and very private holiday house. Or if you are planning a Port Douglas wedding our groups department can take care of all of your accommodation and pre-post tours on the Great Barrier Reef and Daintree Rainforest. A jewel of a holiday home, this holiday house is situated in Port Douglas and central to all that this amazing area has to offer. The Great Barrier Reef is accessible only a short drive away with boats departing daily from Port Douglas Marlin Marina. Port Douglas is located 45 minutes drive from Cairns, along a breathtakingly beautiful scenic coastal highway. Rainforests and mountain ranges, world heritage national parks are on offer in this vacation hotspot in Northern Queensland. Airport Transfers: Please let us know if you would also like us to book your Cairns Port Douglas Airport Transfers. We can arrange a variety of transfer services to your Port Douglas accommodation including Stretch Limousines and coach transfers for larger groups. In perfect harmony with its rainforest environment, ‘The Bali House’ has been architecturally designed and decorated in 5-star Balinese style. This house combines impeccable attention to detail, world class finishes and a wealth of luxury inclusions for sophisticated living.